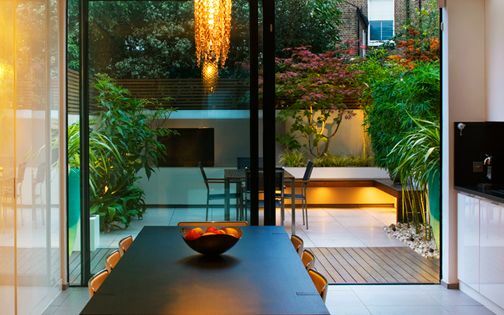 This well-balanced Battersea home was extensively transformed into a contemporary subterranean residence, where only a small garden remained following major structural renovations. 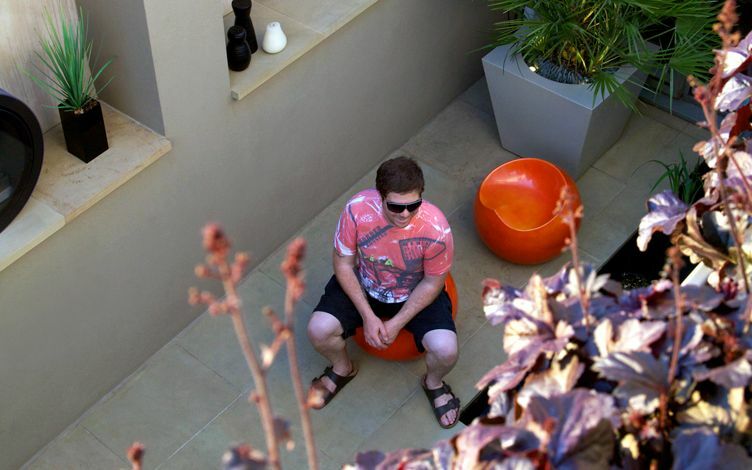 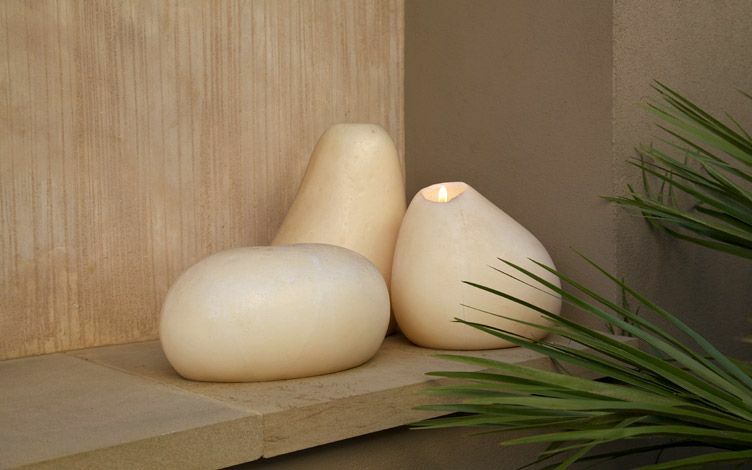 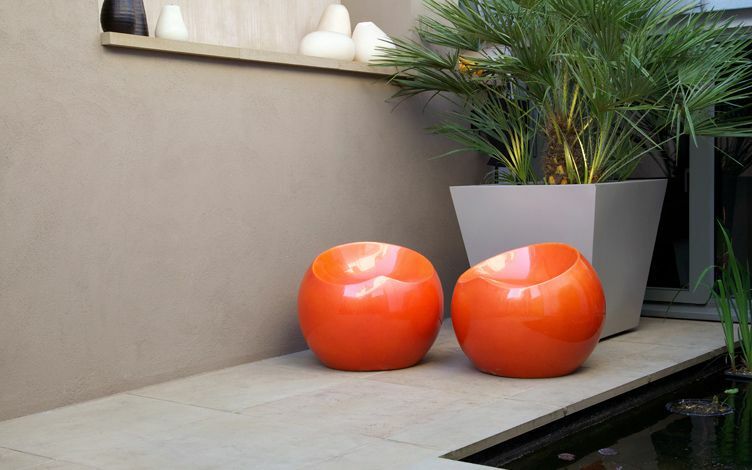 A minimalist patio design encompasses an art collection, wine cellar and a fish pond; its uncluttered layout articulates an integral indoor-outdoor connection, where huddling on stools by the fire and relishing eccentric artworks forms a daily cosy experience of an alfresco patio garden lifestyle. 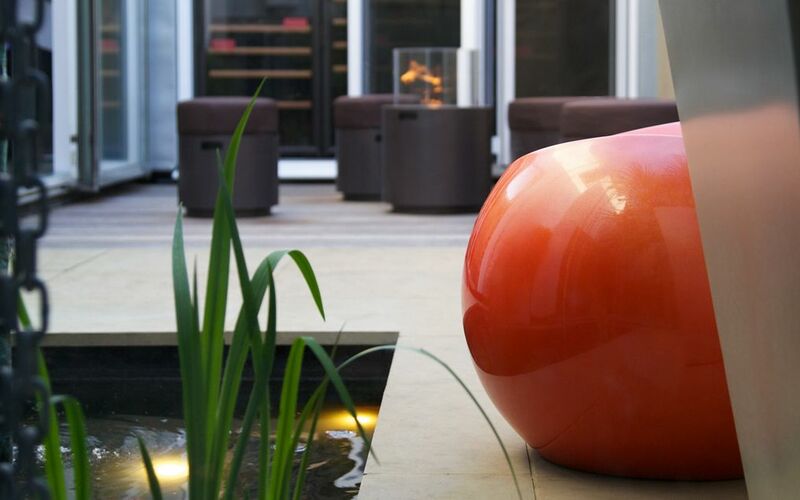 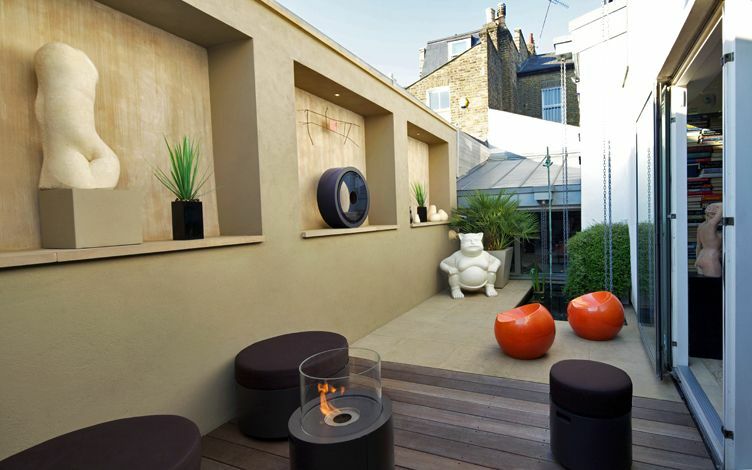 This modern London house has only a tiny strip of outdoor space, yet the neutral tones of its patio design produce an ideal backdrop for our client's elegant outdoor sculpture and colourful offbeat furniture. 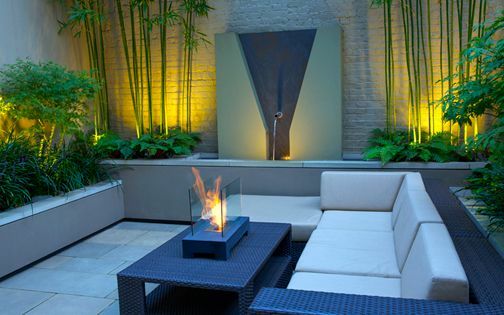 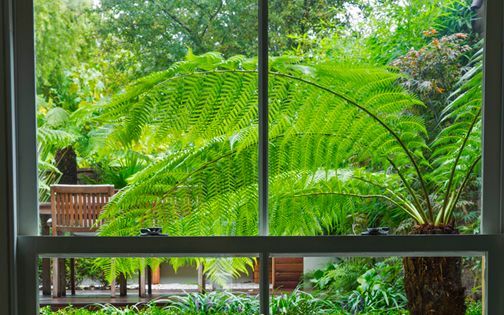 As in many of our minimalist courtyard garden designs, the exterior's outline was crafted bearing low upkeep in mind, while two fascinating features define this small patio garden. 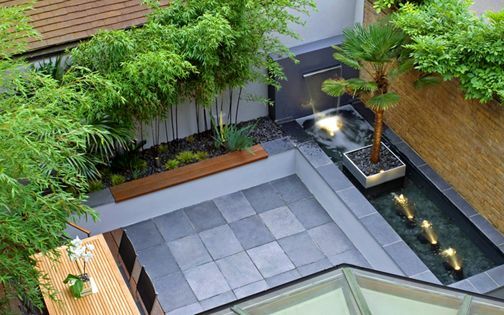 A fish pond and a wine cellar sustain clear reflections on opposite ends, and although rather slight, these patio focal points generate bona fide modern garden ambience with glass across three elevations, linking seamlessly into the house. 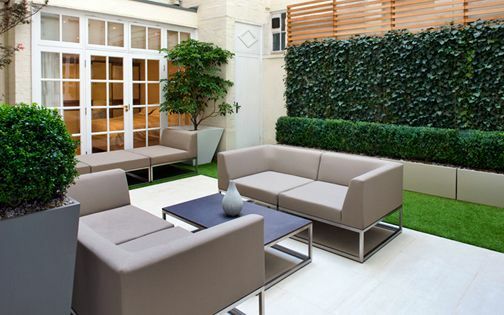 We continued the living room's limestone flooring with a matching smooth sandstone to form a seamless indoor-outdoor patio garden design, juxtaposed alongside a contrasting decked lounge. 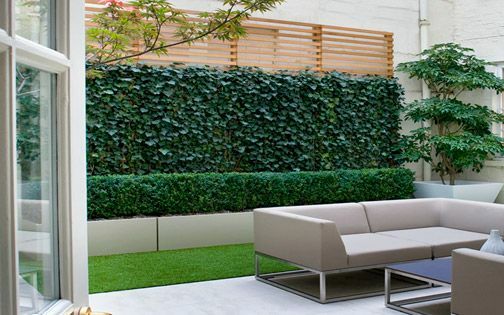 When we first visited the site, a low brick wall was out of sync with the patio garden, where we saw considerable potential in revamping this structure to display diverse artworks. 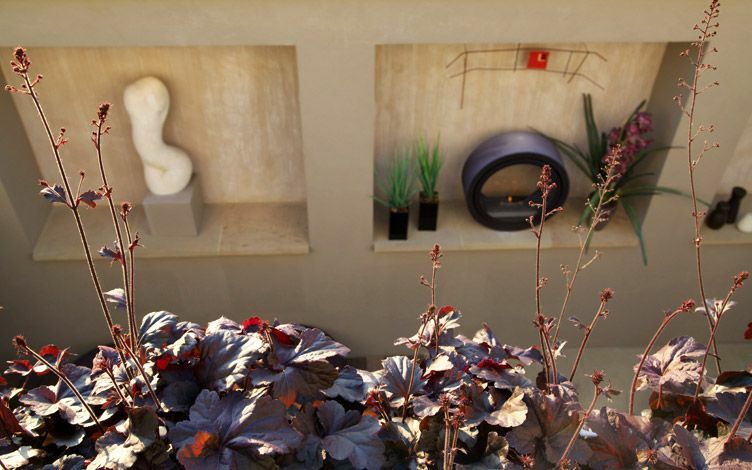 The wall was transformed into an integrated, multidimensional outdoor gallery space, consisting of three perfectly squared recessed bays, centrally exhibiting a David Klein sculpture as a seductive focal point. 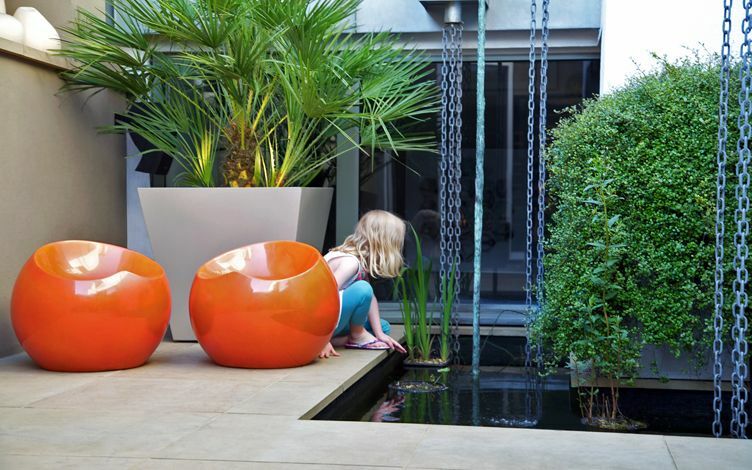 Curved orange seats infuse zingy accents, contrasting a chiefly monochromatic scheme, opposite Muehlenbeckia, an evergreen New Zealand climber which conceals the pond pump; its dainty texture juxtaposed alongside a smooth, tapered planter. 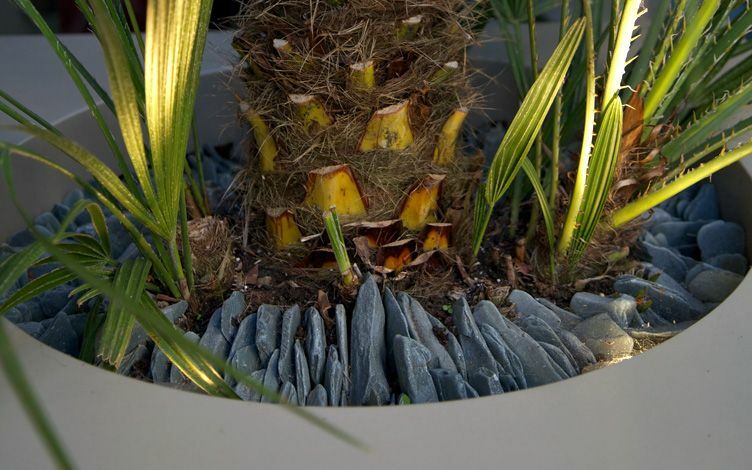 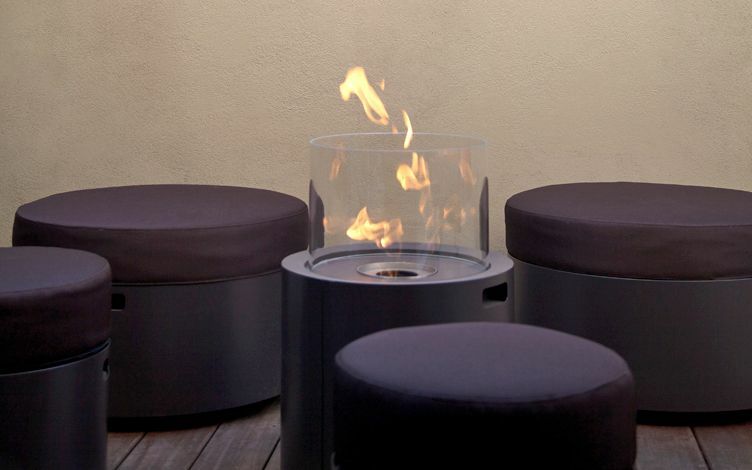 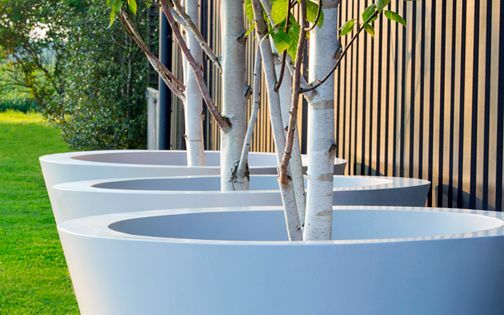 The container's custom-made design, powder coated in taupe, displays an architectural Palm tree at the patio's far end. 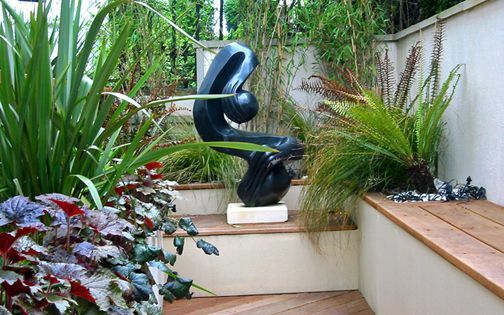 The client, who's a keen art collector, required further space to display modern sculpture, and the patio design's soft muted colour palette provides an optimal setting to highlight intriguing artworks across an intimate personal garden. 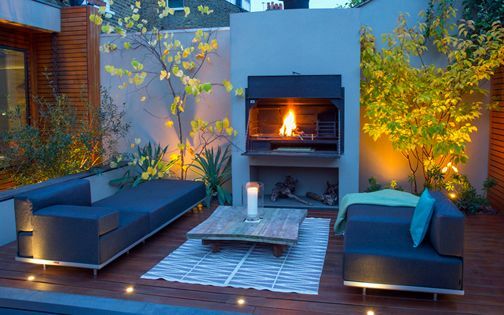 This low-key, secluded outdoor hub is accentuated with vivid furniture, where its owner's upbeat individuality is eloquently conveyed in a slender statue set in water, whimsical artefacts and a series of small alfresco fire features. 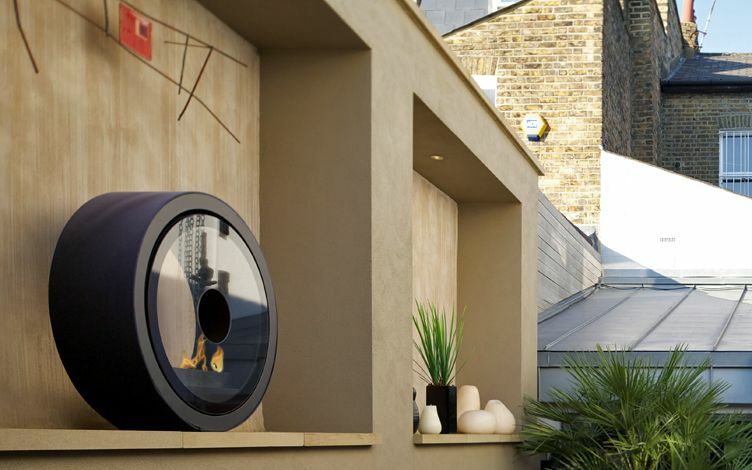 Near the patio doors, a state-of-the-art, custom-built wine cellar contains a private showpiece – the pride and joy of our client. 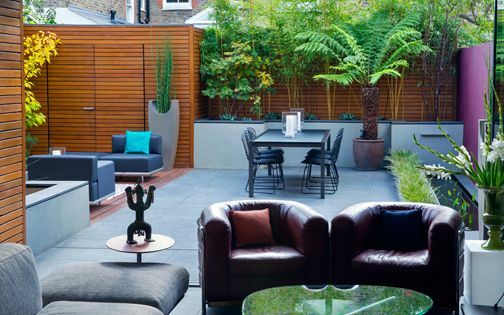 The elongated small patio space is appreciated from an aerial perspective through a kitchen window and an upper terrace outside the master bedroom; its design ideas and ambience embraced in a courtyard garden layout. 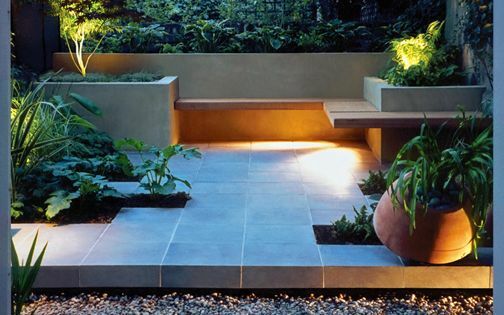 The wall's inner shelves were cladded in smooth buff sandstone, and stainless steel recessed lights were fixed into its deep ceiling, while internal elevations provided scope for a one-off design composition. 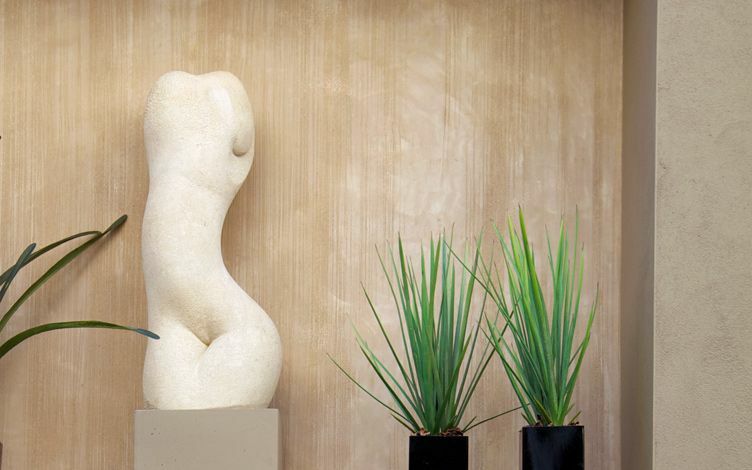 As the residence features a gamut of Marmorino stucco finishes, we commissioned the sgraffito artist Sally Ellwood to craft a pigmented lime render. 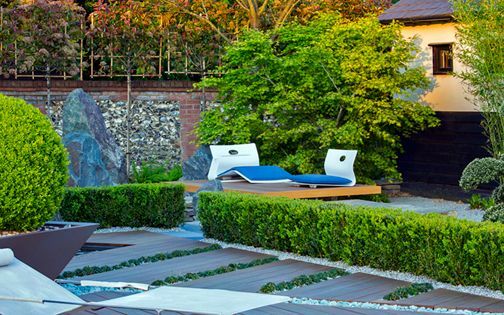 We prepared samples for the client, built scaffolding and let artistic creativity unfold, where a refined result enhances textural connection with the home's interior, enabled through a specialist and multidisciplinary garden design practice. 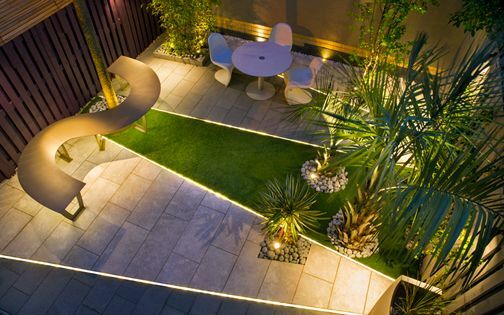 This very small patio garden scheme defines fresh patio ideas developed exclusively for a unique site, and a logistic achievement by accomplishing a reciprocal garden designer and client brief, amid exceptionally confined access, while maximising an unused stretch of land – a trademark associated with many of our South London garden design projects.